Ohio CRP Mixes are specifically designed to meet the Ohio Conservation Reserve Program standards. Each state has standards specific to their own state. It is important to purchase seed mixes that satisfy your specific seeding plan. If in doubt on what to purchase or you have questions, don't hesitate to call one of our seed consultants for a free consulation. Farmers Value gives you an economical alternative for CREP ground in a mix that's still very friendly to wildlife. We've combined orchardgrass, the cool-season old reliable, with two clovers that will attract insects to support birds' baby chicks with plenty of food during their growing season. Farmer's Value gives you the all the basic characteristics you need at a price that's easy on the pocketbook. An astounding display of colorful wildflowers highlight this balanced mix, specially formulated to meet Ohio CREP requirements. The attractive wildflowers play host to a wide variety of insect species. That's critical for baby chicks because insects are their only food during a chick's first 4-6 weeks of life. Supplementing the wildflowers are four short and tall warm season grasses that provide wildlife with nesting material, and a sturdy shelter against harsh winter weather and winds. 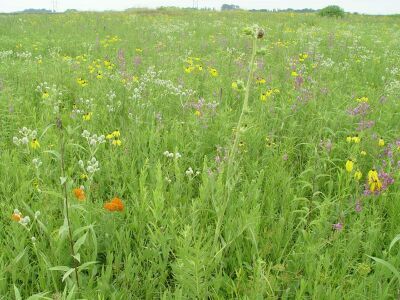 With this mix, it's a pleasure to manage a prairie so advantageous for the land and wildlife.